It is the abiding work of a bishop of the Church to continue making the same faith announcement and proclamation, the presence of the Risen Christ in our world, in our Church and in our sometimes lonely and isolated lives. It is this proclamation of Christ present to us that is at the very heart of my vocation as bishop. Sometimes I have proclaimed the Good News well; at other times over these thirty-five years, I have been timid, weak or have even failed miserably. It is only the loving grace of God, the constant embrace of Christ through thick and thin, and the fiery power of the Spirit that has allowed me to keep at it. It is the people of the Church, so many dedicated priests, deacons, consecrated religious and the many lay men and women and staff, who have stood at my side to encourage me, to lift me up, to challenge my weak spirit, and to remind me of the long term impact of my vocation. It is you who have kept me “casting out into the deep for another catch!” So often you have helped me recognize the many signs of the Resurrection of Christ and his presence. You are witnesses in every parish community and in each Diocese I have had the privilege to serve. Today I thank you for helping me stay the course and remain faithful to my calling. I know I have hurt or offended some of you. I am deeply sorry and beg your forgiveness. We have all been through a lot together. I won’t take the time to list all of the successes and challenges that we have faced. You know them well! But it has been through these very successes and challenges that we have grown together in faith. My friends, I ask you now to continue to trust in God as the Church and our Diocese moves into the future. Join me in embracing Bishop Donald Kettler as our new and ninth bishop of Saint Cloud. He is truly a gift to us from God and the Church. Be for him, as you have been for me, joyful, dynamic, faith-filled people dedicated to loving God and serving Christ’s people, planting the seeds of faith for future generations. The observance of World Mission Sunday is an opportunity for all people to be united through prayer, love and understanding. It is a time to recognize the many men and women who faithfully serve and minister to the people of God in more than 1,150 mission dioceses throughout the world. With little or no resources, they are the present day missionaries of our Church. They continue to bring the sacraments, the living Word of God and the gift of God’s grace to those who are most vulnerable. Through the work of our Mission Office/The Society for the Propagation of the Faith, our World Mission Sunday celebration and collection connects us with the loving work of missionaries throughout the world, for we are all missionaries. The office shares directly in the work of the Holy See, with all missions and all peoples of the world. As our Holy Father Pope Francis states, “The Church’s missionary spirit is not about proselytizing, but the testimony of a life that illuminates the path, which brings hope and love.” He goes on to say that “Missionary spirit is not only about geographical territories, but about peoples, cultures and individuals, because the ‘boundaries’ of faith do not only cross places and human traditions, but the heart of every man and woman.”(Homily, 19 May 2013, Pentecost). This quote definitely reflects my personal views about mission and the important role mission can play in changing hearts and challenging world views. I pray that World Mission Sunday will touch each and every one of you deeply and unite us in providing true assistance and prayers where needed most in the world today. Please join me in helping to make World Mission Sunday a resounding success. On behalf of all those who will benefit from your generous gifts, I thank you. For centuries, the Catholic Church has long offered premier education, health care, and social services to the people of this country and around the world. When we speak of “religious liberty,” we refer not only to freedom to worship in our sanctuaries and teach our doctrines to other Catholics. From the days of our nation’s founders, religious liberty has also meant the freedom to live out the commitments of our faith in public life, making faith’s unique contribution of service, moral guidance and community to our fellow citizens. Lately, this rich heritage of our religious liberty has been increasingly challenged. I have written before sharing my concerns with the “preventive services mandate” from the federal Department of Health and Human Services, often known as the “HHS mandate.” The mandate requires all employer health insurance plans to pay for sterilization, contraceptives and abortion-causing drugs. Despite tens of thousands of written comments from faithful citizens opposing the mandate, and in the face of dozens of lawsuits challenging it, it remains scheduled to go into effect fully Aug. 1, 2013, when even the one-year “safe harbor” granted to organizations with religious objections to the mandate expires. The Catholic Church joins many people of other faiths and those who profess no particular faith in opposing the mandate. We do so for two fundamental reasons. First, contraception and sterilization are not health care, since fertility is not a disease or condition that must be treated medically. Nor are these interventions rare and inaccessible in our nation, as our declining birthrate demonstrates clearly. More troubling still are drugs that directly and intentionally end a human life in the womb, a moral wrong that can never be justified, much less condoned and advanced. Second, even those who do not share this moral vision can join us in opposing its heavy-handed enforcement. The fine on non-exempt organizations for failing to comply (soon to include all those not directly affiliated with a diocese or parish) is staggering: $100 per employee per day. Imagine a Catholic hospital or university employing 1,000 people — and facing an annual fine of over $36 million. Even if accommodations were broadened to allow Catholic institutions themselves to be exempt, private Catholic business owners would not share this protection and small businesses with a workforce of 50 people would likely fail in the face of a $1.8 million fine. The HHS mandate is but one example of the pressure that a growing secularism brings to bear on our moral witness. At its core, the mandate does not advance liberty, ensuring that Catholic values are not imposed on all; rather, it violates our liberty, since it imposes secular values on the church. It is one thing to tolerate, even if reluctantly, the private choices of individuals. It is another thing entirely to be forced to pay for those choices. In opposing the mandate, we are not asking for some special privilege or accommodations. We are simply asking for the same freedoms promised all of us by the Constitution. The church has no desire to oppose the legitimate exercise of civil government in fostering the common good. And given our long history of service to that common good in caring for those who are ill, hungry, troubled or otherwise in need, there is no legitimate reason for civil government to oppose us. I encourage you to join me once again in communicating with the federal Department of Health and Human Services to urge that the HHS mandate be rescinded, or at least revised to provide consistent and genuine conscience protections for all objecting religious organizations and their individual members. If we do not speak up — respectfully, peacefully, but clearly — such silence will be taken either as consent or indifference. Your voice matters, that we might continue to live our faith and serve the needs of our sisters and brothers in the true freedom that leads to God. Following the narrow defeat of the Marriage Amendment last November, efforts to overturn existing marriage law in Minnesota and to legalize samesex marriage here have resumed with greater vigor. Unlike the Amendment efforts, which gave each voter a direct voice, and which some opposed because they did not believe the State Constitution was the place for this decision, the future of marriage law in Minnesota is now in the hands of the State Legislature. Since lawmakers might forever change how marriage is understood in Minnesota, this is a critical time to contact your legislators and urge them to vote “No” on redefining marriage in our state. As the recent U.S. Supreme Court hearings have demonstrated once more, Minnesota is far from alone in being deeply divided on fundamental questions. Yet marriage between one woman and one man remains essential to our social fabric, for today and for our future generations. True, the conversation about marriage is predictably difficult; but this very difficulty reflects the reality that truly central human goods are at stake. By its very nature, the institution of marriage is rooted in the sexual difference of spouses with the inherent natural capacity to bring forth and care for children, co-created with God through their love. The role of lawmakers is not to change the definition of marriage in response to today’s social trends, but to protect and foster marriage between man and woman as it has been known across times and cultures. While no Supreme Court ruling on marriage is expected until late June, the redefining of marriage in Minnesota law is on a much faster track. Legislation to change the definition of marriage in Minnesota has already passed through committee hearings in both the Minnesota House and Senate. Both chambers could vote to make such a change to marriage any day. Governor Dayton has promised to sign this legislation if it reaches his desk. Because marriage is so deeply interwoven in our social fabric, a decision to redefine marriage would not be an isolated action. Rather, it would trigger a cascade of changes in literally hundreds of other laws. The time and resources of lawmakers would be distracted for years to come in addressing the implications of such a radical innovation. This is a decisive moment for the future of marriage. It is crucial that support for traditional marriage be communicated to lawmakers. I ask you to join me in sending this message, respectfully but also loud and clear. The Minnesota Catholic Conference has made it easy for you quickly to send an email to the legislators who represent you and make your voice heard. Tell our lawmakers not to change the legal definition of marriage in Minnesota. Go to www.mncc.org, click on the MN Catholic Advocacy Network icon in the right corner, then click on the link that says “Tell lawmakers not to mess with marriage in Minnesota!” under the Advocacy tab. Here you’ll find your legislators’ contact information and an email form that quickly sends a message to all of them with a simple click of the button! During this Holy Week we have been accompanying Jesus in his Passion, this year with the help of St. Luke’s Gospel. In Luke’s Gospel, we see the compassion and merciful love of Jesus with both the parable of the Good Samaritan and the Prodigal Son returning to his father. Now in Luke’s Passion Narrative, Jesus continued to show compassion by healing the servant’s ear, stopping on the way to Calvary to speak consoling words to the women of Jerusalem, and forgiving the good thief from the cross. Jesus then forgave those who crucified him. Now we are in the midst of the Sacred Easter Triduum, the three day feast of the liturgy of the passion, death and resurrection of the Lord Jesus. “Triduum means three days. Easter is three days. 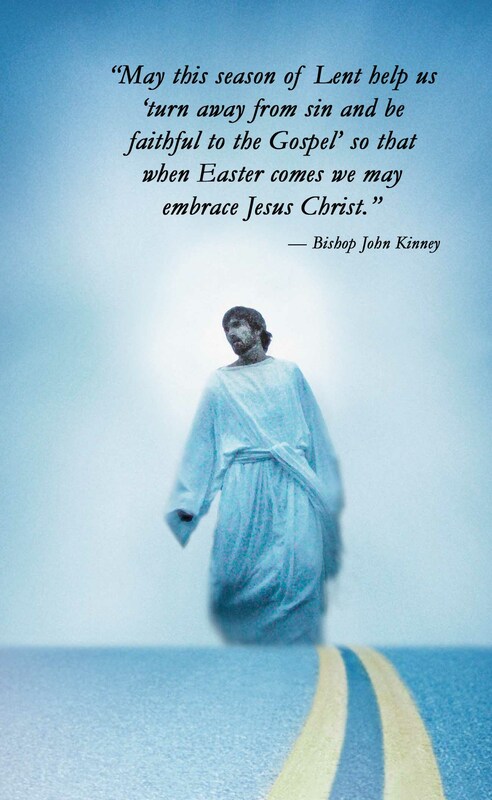 Easter is one liturgy, a festival in honor of the God who raised up Jesus from the dead.” (St. Andrew Bible Missal, p. 309). light, not darkness; Paradise, not its loss. was wounded in hands, and feet, and side. a tree now brings us life. A Blessed Easter to all of you.
. . . the greatest among you must bear himself like the youngest, the one who rules like one who serves. For who is greater — the one who sits at table or the servant who waits on him? Surely the one who sits at table. Yet I am among you like a servant. You have stood firmly by me in my times of trial and I now entrust to you the kingdom that my Father entrusted to me . . . Simon, Simon, take heed. Satan has been given leave to sift all of you like wheat; but I have prayed for you, Simon, that your faith may not fail; and when you are restored, give strength to your brothers” (Luke 22:26-29, 31). 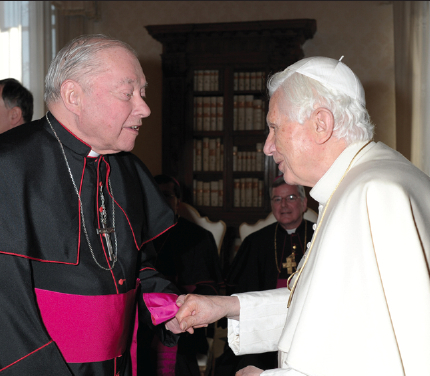 In various ways over these years each of these Successors of Peter have given strength to our diocese and to me. The ministry of Peter in the life of the church is strengthening for all of us. I ask you, now, to join me in thanking God for the pastoral ministry of His Holiness, Benedict XVI. Grant him strength in frailty, comfort in sorrow and serenity amid trials. Now we turn to the Holy Spirit: “Light in us a new fire as a Successor of Peter is chosen for the church”: O God, eternal shepherd, who govern your flock with unfailing care, grant in your boundless fatherly love a pastor for your Church who will please you by his holiness and to show us watchful care. Through our Lord Jesus Christ, your son, who lives and reigns with you, in the unity of the Holy Spirit, one God, forever and ever. Amen. What is keeping me from God? The Church again calls us to this season of Lent. 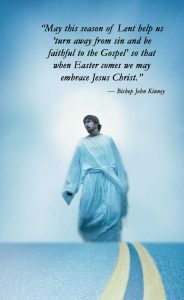 As catechumens and candidates for full communion prepare for the Easter sacraments, Christ is also asking us to experience a new conversion in our lives, to turn away from sin and believe in the Gospel. That is why the ashes were daubed on our foreheads on Ash Wednesday. These 40 days will be filled with prayer, fasting and almsgiving as well as the Sacrament of Penance in our lives. Thus we will “repent and believe in the Gospel”. Last week, just before Ash Wednesday, I joined with my ordination classmates to bury a dear friend and priest confrere, Father Roger Pierre. 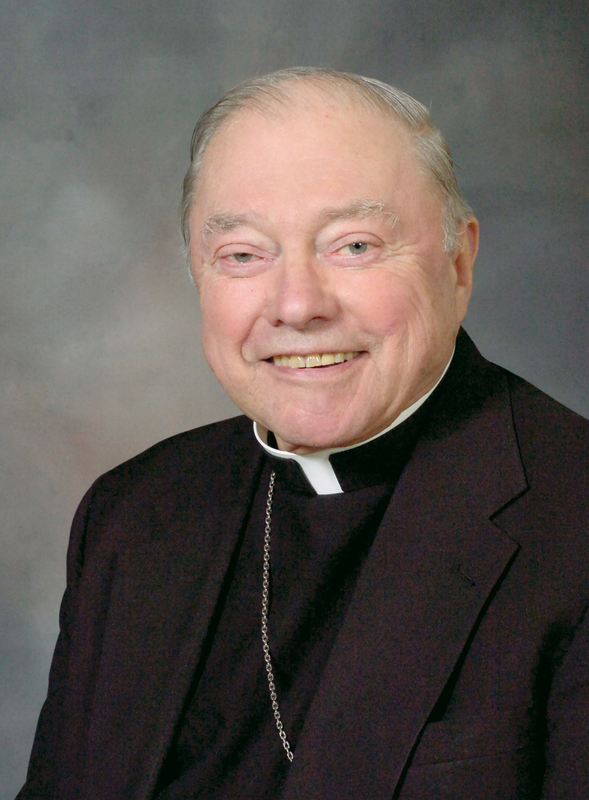 He was a wonderful priest of the Archdiocese of St. Paul and Minneapolis. As pastor of St. Richard’s Parish in Richfield, Minn., he ministered to my mother before her death. He served Christ and the Church faithfully for almost 50 years. These last years he also endured the effects of Parkinson’s disease and cancer in his own body. By all accounts at his funeral, he was ready to meet God. These disturbing Lenten questions helped me know how very gracious and loving God is, allowing us yet another Lent to prepare ourselves to meet God face to face, permitting us yet another opportunity to be converted in our hearts. None of us knows how much time we still have here on this earth, so each day, each Lent, is another graced opportunity to prepare ourselves at last to “gaze in the loveliness of the Lord”. May this season of Lent help us “turn away from sin and be faithful to the Gospel” so that when Easter comes we may embrace Jesus Christ: “[We] want to know Christ and the power of his resurrection, and the sharing of his sufferings by becoming like him in his death.” (Philippians 3:10; New Revised Standard Bible translation). As our nation observes the 40th anniversary of Roe v. Wade, we mourn collectively the loss of 56 million children whose lives were ended before birth. The numbers are so staggeringly large that they can become meaningless to us. We grieve with the parents and families of these little ones, whose loss and regret often remain hidden, affecting their lives and robbing them of joy with a grief they feel unable to share openly. We see the coarseness of our society, which so often suffers with violence and indifference to the needs of others in the pursuit of individual choice unmoored from considerations of responsibility and consequences. The Supreme Court Roe v. Wade decision was just four years old when I was ordained a bishop in 1977. This sorrowful chapter in our nation’s history has been a constant accompaniment over these years, and the destruction of innocent life has sadly come to be considered routine and jealously guarded by some as an unassailable right. The issue of abortion is often distorted through lenses of political platforms, the dominion of choice, private decisions and legal precedents. What is so easily lost in such abstractions is the precious and utterly unique gift of life from God that is each child. Think of the different people you know, no two alike in appearance or personality — so too are each of these children and the human community has been deprived of what they might have been and done in our midst. Of course, Roe v. Wade did not emerge from out of nowhere. It was the consequence of many other changes in our culture and, as Blessed Pope John Paul often said, only a change of culture — through a change of human hearts — will make abortion a thing of the past, safeguarding each human life while attending to the needs of those in difficult pregnancies. This is the ongoing work of proclaiming the Gospel of Life, and I want to thank so many of you in our diocese and across our country who take this work in hand. 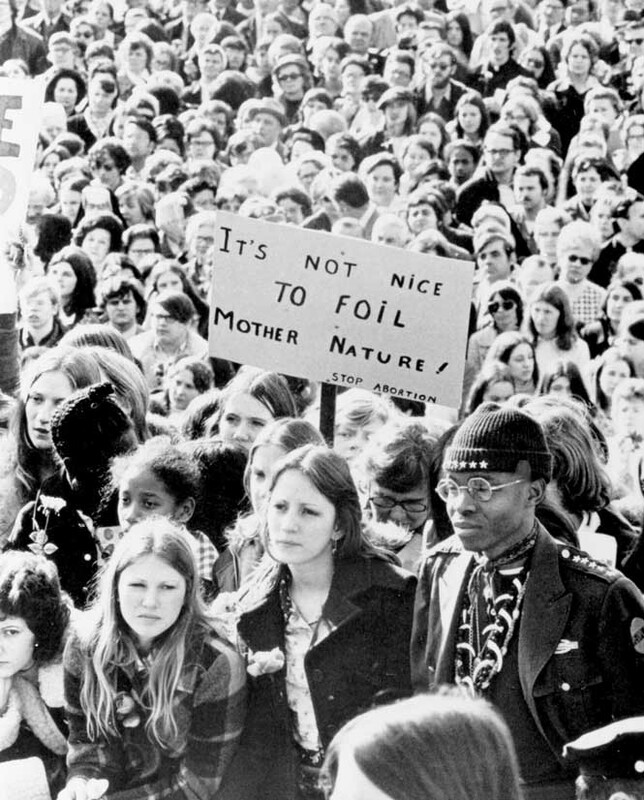 While recalling 40 years of legal abortion understandably creates a somber tone of sadness, abundant signs of hope are also part of our history since 1973. Crisis pregnancy centers greatly outnumber abortion clinics, providing maternal-child care, emotional, spiritual and practical support and skills for parenting and decision-making far into the future. Education and outreach strive to address root causes of unintended pregnancies and offer life-affirming alternatives. Project Rachel and similar ministries offer healing and hope to women and men after abortion. A younger generation sees the possibilities in faith and advocacy for life, refusing to accept that abortion, poverty and violence must be a part of our society; their idealism and energy challenges us to renew our efforts and not give way to discouragement or the inertia of the past. Persevering and fervent prayer for life reassures us and calls upon the power of the Holy Spirit to do what no human power can accomplish. That Spirit — the Lord and Giver of Life — is at work among us. In this Year of Faith, we call upon this Advocate to make us “strong, loving and wise” (II Timothy 1:7) in witness to the gospel of life. Thus, along with my brother bishops, I encourage you to join in the nationwide Call to Prayer for Life, Marriage, and Religious Liberty as you are able. This includes the possibility of fast and abstinence from meat every Friday; the daily rosary as individuals or families; including these intentions at the Prayer of the Faithful at our Masses; a holy hour the last Sunday of each month; and a second Fortnight for Freedom to be observed this summer. In our 1998 statement, “Living the Gospel of Life,” the U.S. bishops concluded by invoking Mary. As her faith and openness to life allowed God’s mercy to take flesh in Jesus, so we ask for those same gifts that Christ’s teaching may take flesh through our lives. Mary, Patroness of the Americas, renew in us a love for the beauty and sanctity of the human person from conception to natural death; and as your Son gave His life for us, help us to live our lives serving others. Mother of the Church, Mother of our Savior, open our hearts to the Gospel of life, protect our nation, and make us witnesses to the truth.